If you are a facility manager, it is important that you identify products that will not only improve safety, but help maintain a healthy maintenance budget. PEM slip-resistant matting is a great choice for any aquatic facility—no matter the size. Recently, the folks at the Marriott Courtyard Seattle Downtown/Lake Union installed some of our aquatic matting around its indoor pool. Like most indoor pool areas, the walking path around the pool is covered in tile. While tile offers a great solution for easy cleaning, it does create a pretty serious slip hazard. In comes PEM aquatic matting! 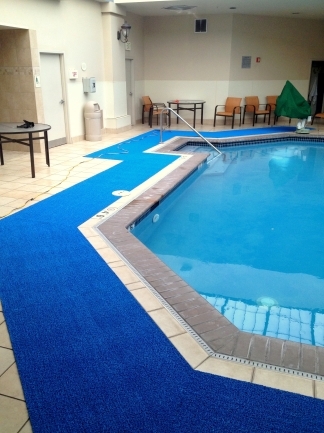 Our matting is designed to reduce the risk of slips and falls around pools. Its textured surface allows for both comfort and stability, creating a safer environment for all. Does this mean we would recommend running around the pool? Absolutely not! While our aquatic matting offers superior support, it does NOT mean you can’t slip. Remember: always use common sense. Our very popular blue tone also fits in well with the entire facility. It really stands out, ensuring pool-goers walk along the matting when entering and leaving the pool. In addition to its slip-resistant power, our aquatic matting is also easy to clean. Its antimicrobial formula safeguards against the growth of fungi, mildew and bacteria.